1-D metal oxide nanostructures, especially those with semiconducting properties, have attracted much attention in recent years due to their potential and emerging applications, specifically in environment purification and energy devices.a For these applications, there have been many efforts to grow 1-D nanostructures in the form of nanotubes, nanorods, and nanowires using processes that conserve… energy, are cost effective, and can be scaled up for large scale production.a 1-Dimensional Metal Oxide Nanostructures gathers under one title the most recent development of oxide nanomaterials especially those fabricated via oxidation process in the nanoscale field. Thermal and anodic oxidation processes are reviewed with an aim to offer an in-depth understanding of mechanisms of 1-D nanostructure formation, their characteristics, and limitations. Other more common methods are also discussed including sol-gel, hydrothermal, and other templated methods. 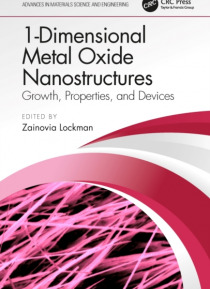 Important applications of 1-D nanostructures are then presented focusing on oxides like zinc oxide, titanium oxide, zirconium oxide, copper oxide and iron oxide. A chapter on carbon nanotubes hybrid with these oxides is also included as well as on silicon oxide nanowires formation by local anodic oxidation process. Aimed at researchers, academics, and engineers working across the fields of nanotechnology, materials science, chemistry, physics, semiconductors, and environmental and biomedical engineering, this essential reference enables readers to grasp the main concepts of nanomaterials in 1-D: formation technique, characteristics, and uses. It also encourages practical innovations in nanotechnology especially in curbing pressing global issues related to energy, environment, and security.